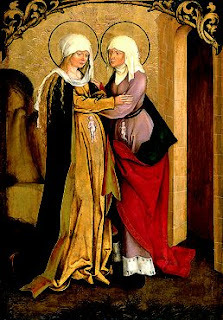 The Visitation of Mary to Elizabeth is one of my favorite feasts. I love it for its humanness; I love it for its glowing simplicity. Mary visited Elizabeth because she had BEEN Visited by God. She didn't go to Elizabeth alone - she went with the Presence of Christ inside her. As members of the body of Christ, we carry Christ also. Oh, not in the same unique way, certainly. But according to Church teaching, we indeed carry Him within. The Catholic Bishops’ Conference of England and Wales has requested that every parish celebrate a Mass with prayers to commemorate the Diamond Jubilee of Her Majesty Queen Elizabeth II this Sunday 3 June - the Solemnity of the Most Holy Trinity. During this Mass, the first reading will be replaced by 1 Kings 3:11–14 and the prayer for the Queen will be said after the post Communion prayer and before the final Blessing. V.O Lord, save Elizabeth, our Queen. Our son's chamber music group held their concert last night at Trinity Episcopal Cathedralin Trenton, New Jersey, about an hour's drive from our home. I had to drop him off at 5 p.m. and the concert didn't start until 7. One thing I did to while away the time was to take some photographs of the cathedral with my cell phone. Two photos worked out pretty well. 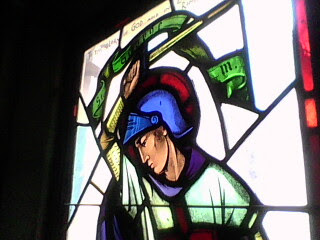 This is a segment of a stained glass window of St. George, the patron saint of England. He was born in Turkey to Christian parents. A Roman soldier, he was martyred in 303, the year that began the the "Great Persecution" against Christians. The late afternoon sun really showed off the vivid blue helmet, the red halo and the determined look on his face. Vigil Mass and Mass During the Day (The readings for the Vigil Mass are on the upper part of the page, those for the Mass During the Day on the lower part of the page). Liturgical Note. Pentecost, like Easter and some other solemnities, has a Vigil, properly so-called. This is not an ‘anticipated Mass’ but a Vigil Mass in its own right, with its own set of prayers and readings. It fulfils our Sunday obligation. There may be an extended Liturgy of the Word,er similar to the Easter Vigil, with all the Old Testament readings used. Rich spoils of beauty at Our Lady's feet! Of delicate blossoms and of fragile flowers. Who is the peerless Rose of Paradise. And in her praise their passionate souls exhale. Madonna! Mother of our Christ and Lord! Hail thee and hymn with canticles sublime. I love the site www.WholeNewMom.com for the ways in which it has allowed me to satisfy my sweet tooth since I've gone gluten-free (and more recently anti-candida). What a great site! If you are, like me, dealing with health issues that have forced you to navigate a whole new way of looking at food, you will love what Adrienne offers on her site. I've found it to be a wonderful resource with great print-ready recipes that really do taste great (don't get me stated on how many e-books I've downloaded only to find the recipes taste like cardboard). Adrienne has a nice team of bloggers and contributors that are tackling the same sorts of things I am--and maybe you are, too. If you are gluten-free and still crave some sweets, or if you or someone you love has allergies that restricts the sort of cooking you can do, you will love what you find at www.WholeNewMom.com! Do you like everything in a nutshell? Here is a list I stumbled across today while I was reviewing my file folder of notes from a course I took in 2000. I don't know the source. It may have been a handout from the professor, Richard M. Gula, S.S., who was an excellent teacher. If you are interested, you can read the list here. Father's day is approaching - Take a look (in the link above) at a book perhaps very fitting for a special father in your life. You know what I love about the internet? You can discover all kinds of information with your fingertips AND you can buy all kinds of obscure stuff from all over the world. Quirky things that can actually help build a child's faith and prayer life. Alec, a family friends' middle child, celebrated his First Communion today. 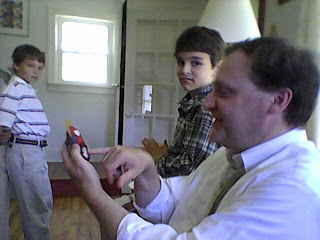 That's him at his home next to his dad after the Mass after he changed into a plaid shirt and striped shorts. His patron saint is Alexander of Comana, the charcoal burner. Seriously? I had never heard of the guy. The Daughters of St Paul are a religious congregation with a particular mission to evanglising through the media. In the past, this has been typically the print media and then audio-visual media. Nowadays it includes the electronic media. One of their sisters in the United States has a blog which reflects their engagement with electronic media: Windows to the Soul Blog. I have in the past found it an interesting blog because of posts offering reviews of films or observations about how films, sometimes unexpected films, provide a way of exploring questions of a spiritual nature. While vainly upward searched each eager eye. That He shall thus return as they beheld Him go. One of the most beautiful aspects of my Catholic faith has been devotion to Mary, the Blessed Mother. I was thinking about this post today before mass as I was waiting for PSR to get out so that I could go to church with my family, chasing my toddler down to brush her hair, and struggling with a pecular stinging sensation in my lower back, and asking Mary to pray for me! And then it occurred to me that my understanding and devotion to Mary has grown and changed as I have grown and changed. I didn't need a degree in Marionology to understand a relationship with Jesus's mother. She has always met me where I am. When I was little Mary seemed like the elegant lady, the untouchable, unreachable, princess-like figure of the beautiful pictures and statues we had of her. And although I felt so small compared to Mary, her presence as Queen filled me with awe and respect. A private intention of my own. I entrust my prayers to St Joseph wise and loving patron and friend. Present my prayers to your Most Holy and Beloved foster son my Lord and my God. His Eminence, Cardinal Cormac Murphy-O’Connor delivered the Far and Near Club Lecture at Leicester Cathedral yesterday evening. He explored three ways in which religion and, most particularly, Christianity relates to society in the public square. The Cardinal’s reflection focused on the centrality of the family, the dignity and importance of elderly people and the relationship between faith and reason in today’s world.